We’re in the middle of January and it’s cold—what’s there to do? There are actually several ways to embrace the wintertime in Chicago, with both indoor and outdoor activities that are really fun and memorable. Chicago is always bustling with energy, so there’s never a shortage of exciting events and exhibits around. 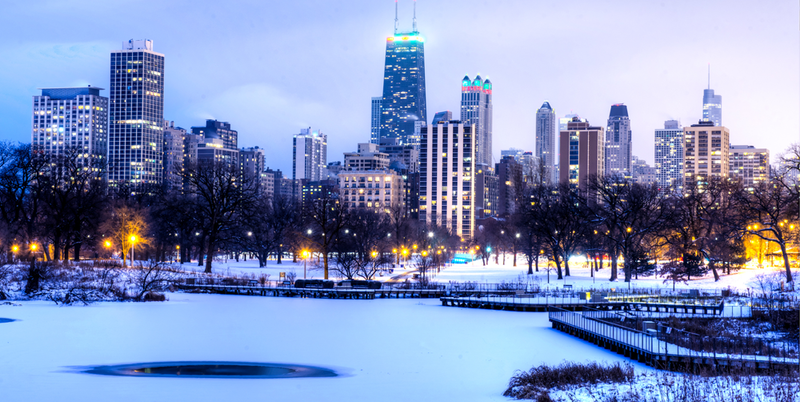 If you’re still unsure of where to look, we’ve got you covered: here’s a guide to the best things to do when visiting Chicago in the winter. Why not spend the day indoors with inspirational and educational exhibitions at The Art Institute of Chicago? This museum is rich in culture, art, and history, making it the ideal setting to express your own creativity and feel enriched. What’s more, there are specific events and seminars to choose from, so be sure to check the website for upcoming opportunities. Also, some hotels offer special packages for visiting The Art Institute of Chicago, so check with concierge upon booking. Head 1,000 feet above the city to look out from above, taking in all of Chicago’s beautiful skyscrapers and architecture. Head on up to the top of the John Hancock building, which offers 360-degree views of the city. You’ll feel invincible—it’s an experience like none other. Be sure to snap some great photos from above! Bundle up and embrace the cold weather at Millennium Park, and head to the McCormick Tribune Ice Rink. As it’s open until March, there are plenty of opportunities to get your skates and take to the ice. It’s free—all you need is skates, or else you’ll need to buy the rentals. So, grab your friends and family, if with you, and get ready for a few hours of some outdoor fun. Plus, if you’re looking for more rinks, you’re in luck: Maggie Daley Skating Ribbon, Navy Pier’s Winter Wonderfest Rink, and the Ice Rink at Lincoln Park Zoo are available! You can always take in a Broadway show, as Chicago features fantastic plays and musicals year-round. During the wintertime, you can see Wicked, Hamilton, Potted Potter, and more. You can also look into Chicago’s many local theaters, such as Goodman Theatre, Steppenwolf Theater Company, Chicago Shakespeare Theater, or Second City. Chicago is bursting with fresh talent, so you should definitely get tickets to something that peaks your interest. If you’re in Chicago, it’s easy to spend a day at Navy Pier, as there are several activities to choose from, both adult and kid-friendly. Between rides, the Ferris wheel, and specific events for live entertainment, to movies, beer gardens, and delicious restaurants, the hours will simply fly by, as there are tons of areas in Navy Pier to explore.